Razor-Thin Margins, Cutthroat Competition – It’s Tough out There. The food and beverages business operate in an environment where manufacturing, distribution and for some even cultivation are of major management concerns. Responsiveness and delivery accuracy determines who wins and who loses a customer’s business. In a competitive market with pressure on prices resulting in low margins, cost control is imperative. Sage 300 ERP could dramatically improve operating effectiveness and efficiencies. We may not offer it right out of the box, but it is very adaptable to a wide range of industries, and for a small and mid-sized manufacturing companies Sage 300 manufacturing suites may be a better fit financially as well as ease-of-use. Improved integration and consolidation of your business process to reduce redundancy, maintenance needs and cost. 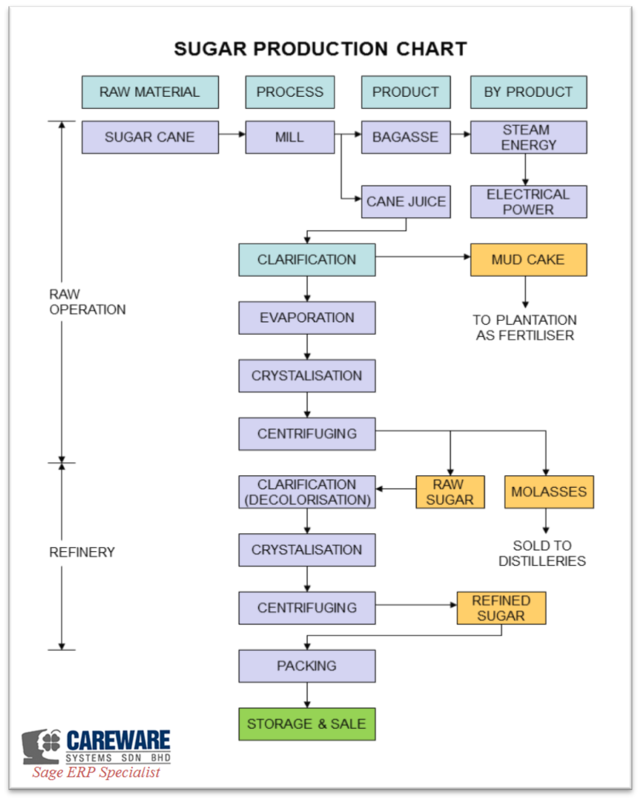 Illustration of agribusiness and its manufacturing processes. For Illustration Only. Any resemblance to your company is by coincidence. Some of the biggest issue in the food and beverage industry today is that of food safety and quality. As a result of growing concerns about food contamination risks and other food-related health and ethical issues, tougher standards are being implemented globally that are redefining the way imports enter some countries. Lot traceability is a unique requirement of the food distribution business. Our solution for Food and Beverage provides support for total supply chain management and accommodate the unique needs, as spoil date, RMA, Stock aging, weights and units of measurements. Careware has successfully implemented Sage 300 for Food and Beverage industry with fully-integrated solution that is easy to install, and inexpensive to operate. 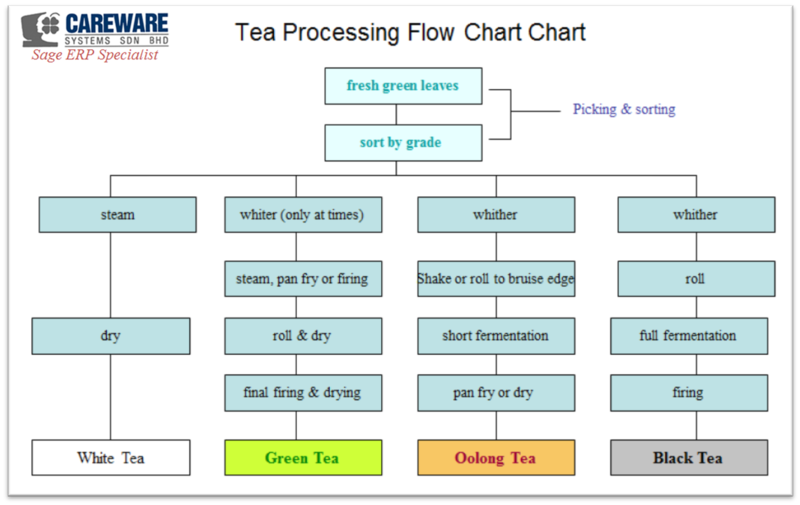 It can handle all types of products and processes in the food and beverage industry. Contact CAREWARE’s Manufacturing Account Manager Today. Sage Manufacturing Solutions - Which Solution Is Right For You? Manufacturing organizations like yours, especially those in the small to mid-sized segment need to focus on the markets and business processes that are producing results while working to improve operational efficiency and enhance customer response. To do so, you require in-depth visibility and insight into the information at the heart of your manufacturing business. Sage Manufacturing Solutions delivers not only the core accounting and operational features you need, but a rich manufacturing-based feature set that helps drive efficiency, customer satisfaction and profitability. Sage 300 Manufacturing is designed for small to medium-sized manufacturing firms using Sage 300 ERP Financial & Distribution Software as its backbone. The system is the ideal solution for manufacturers who are experiencing rapid growth and therefore need even greater control over their back office and shop floor processes. Sage 300 Manufacturing is designed to be in easy to use and fast to deploy with advance functionalities that a growing company requires. Sage 300 Manufacturing is suitable for Make-to-stock and Make-to-order manufacturers as well as Custom Job shops. The Sage 300 Business Solutions can also be integrated with Sage Business Intelligence and Sage CRM solutions, enabling you to build an enterprise-wide management system. 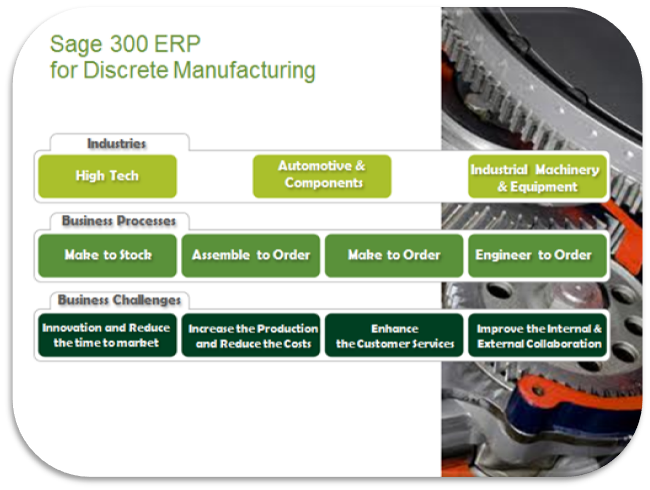 SAGE 300 - Manufacturing has been successfully implemented all over the world. Our products are extensively used in Asia, Australia, Africa, UK and North America. 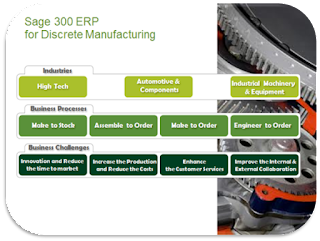 Some industries where SAGE 300 Manufacturing products are used include Automotive Tools & Parts, Electronics Assembly, Pharmaceuticals and Equipment Manufacturing. Sage X3 - Manufacturing business management system is the ideal solution for manufacturers who have sophisticated requirements both in the back office and on the shop floor. Whether you are a medium-sized business, manufacturing for the domestic market, a large business with overseas operations, or the subsidiary of a multinational, Sage X3 has the power to meet your needs. Sage X3 is a comprehensive Enterprise Resource Planning (ERP) system, covering finance, distribution, manufacturing, supply chain management, services, customer relationship management and business intelligence. With flexible deployment options on premise and on cloud supporting a wide a range of operating systems and industry standard databases, and can scale to thousands of concurrent users. Sage X3 offers a comprehensive range of manufacturing functions, including support for areas such as Process, Discrete or Mixed mode manufacturing, Job Shop, Planning & Scheduling, Product Lifecycle Management and support Lean Manufacturing. Sage X3 is a highly flexible solution that can be customised to meet the specific requirements of your business, as well as integrated with “best of breed” applications in areas such as Warehouse Management, Quality Assurance and Demand Forecasting. Although Sage X3 ERP is very capable in discrete manufacturing, it is especially strong in the Process Manufacturing sectors such as chemical, pharmaceutical and biosciences and has many good and satisfied customers who use it worldwide. 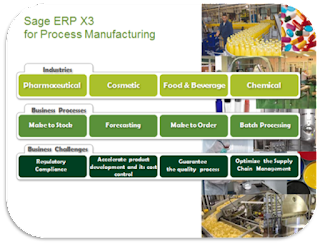 Its helps to automate batch process manufacturing environments, Sage X3 ERP solution combines fully integrated process manufacturing, production planning and financial management capabilities. By implementing this solution, you will be equipped with the software you need to coordinate your entire manufacturing operation. To learn all about Sage Manufacturing Solutions contact CAREWARE Manufacturing Account Manager today by calling (03) 27143855 or by emailing sales@careware.com.my There are multiple licensing options; one is sure to be a perfect fit for your company. Kuala Lumpur, 5 April '2017- Sage Asia introduces to it market Sage People :powerful, simple and flexible HR. As global and local business landscapes are constantly changing, HR practitioners today demand a system that is not just reliable and efficient, but also configurable, intuitive to use and able to handle ad-hoc and unexpected cases. Our product does just that. Many relies on Out-dated HR systems with loose or no integration with accounting and ERP systems add to the complexity of managing human capital in mid-sized companies and create inefficiencies across the organization. Lack of visibility into employee productivity and cost leads to misestimating workforce costs, and this eventually erodes profits and competitiveness in your organization. Sage People is focused on mid-size companies and multi-national companies. It is designed to empower your workforce to succeed by optimizing HR processes in real-time via employee self-service modules and accommodating to various payroll requirements. Built on a set of best-in-class human resources practices and functionality, it is aligned to increase productivity, accelerate business performance and lower the costs of ownership. Available as Sage People 300 and Sage People X3. Discover Sage People: a better way to manage the employment journey from joining to leaving for midsize enterprises, providing core HR, payroll, talent acquisition, talent management and HR planning. To learn all about Sage People Solutions, contact CAREWARE Account Manager today by calling: Tel: (03 2714 3855) or by emailing to: sales@careware.com.my.